Calendar themed clear stamps featuring the months of the year. Impression Obsession cling stamp featuring the calendar numbers 1-25 in the shape of a Christmas tree. Clear stamps featuring months of the year and "Save The Date". Waffle Flower Crafts Clear Stamps. Ideal for cards, scrapbooks, stationary and other crafts! Position stamps on a clear acrylic block and stamp. Easily remove stamp from block and return to the transparent backer sheet when ready for storage. 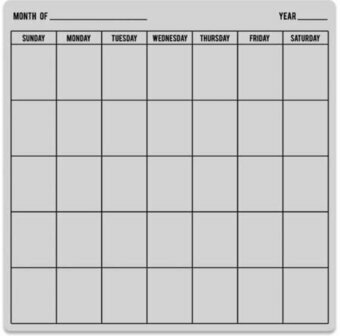 The Hero Arts Calendar Bold Prints is a 66 Cling Stamp that creates a tidy calendar template to keep you organized. Stamp with different colors and embellishments to create your own calendar designs. Our cling stamps are handmade by Hero Arts. They cling to an acrylic block and can then be removed for easy storage and used time and time again. Darkroom Door Rubber Stamp Sets are mounted on cling foam and supplied in a DVD size storage case with a spine for easy identification. Darkroom Door rubber stamps are known for their durability, deep etching and high image detail. Size: 175mm x 115mm (6.9" x 4.5"). Clear stamps from the Studio Calico Snippets collection. These clear stamps are ideal to blend with both Studio Calico and Hero Arts papers, inks, and accessories, and are a perfect synthesis of cardmaking and scrapbooking creativity.